The gum extracted from the seeds of guar plant is chosen for multiple industrial applications as it contains wide range of properties which remains supportive in many industrial applications. 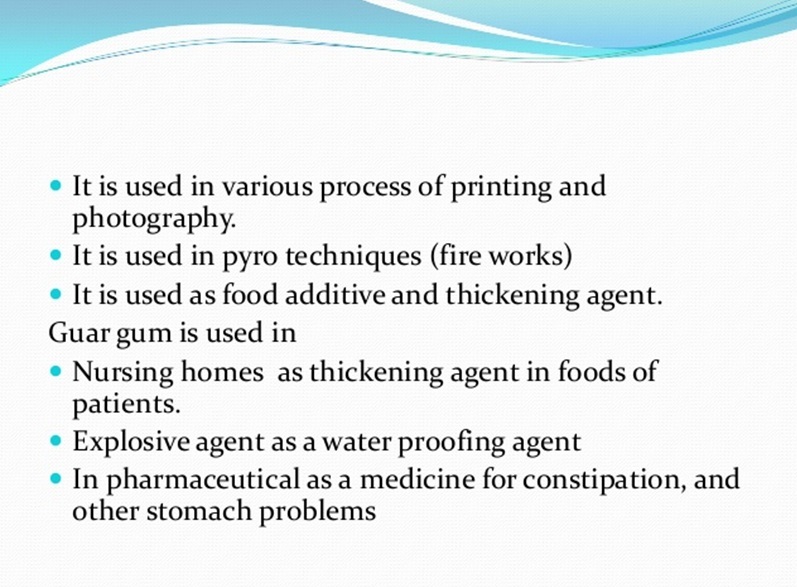 The endosperm gum powder is purified under different methods before it is accepted for industrial usage. It is decided upon the reactivity shown by its endosperm when blended with different substances and components at the time of extraction and purification. However, when it comes to commercial use, the seeds are sent for varieties of purification methods in which the natural properties takes a different turn through showing less ration of protein and polysaccharides contaminations. In some cases the chemical properties changes when processed under cross linking methods. The by-product obtained after every form of cross linking is chosen for industrial applications based on molecular weight and properties. As already discussed every kind of purification or processing is carried on based on its usage. 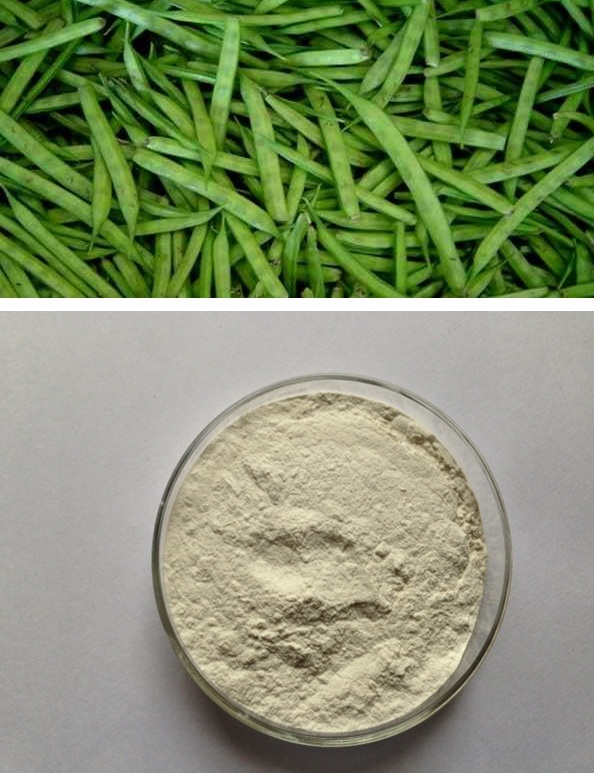 As far as guar gum for biological applications is concerned, the endosperm that is processed through purification with substances which reduces protection fraction and helps to obtain pure form of biopolymer. This is then applied for the above range of usages. Presence of low protein content. This type of processing method is cost effective when compared to the traditional methods. 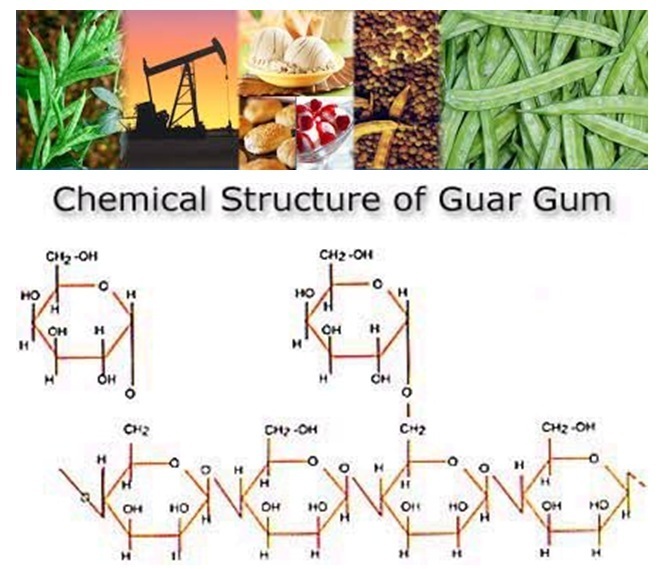 Guar gum is a natural polymer; therefore it contains several types of impurities. Hence, before transforming into gum powder, the extracted product is processed under different methods to obtain a suitable by-product that fits for particular industrial usage and the seed extract is also processed using chemicals to make it eligible for biological usage. The rapid hydration property of guar gum when dissolved in cold water is the key factor that provided excellent thickening ability. The molecules of galactose and water interact and result in inter-molecular chain. This kind of reaction takes place when the particles are dissolved in aqueous solution therein transform the whole solution to become bulky. 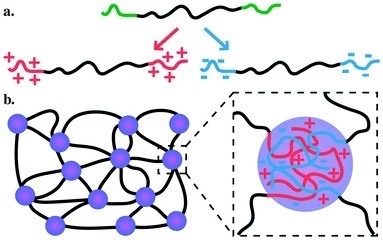 If the concentration of endosperm gum increases, the formation of inter-molecular chain also gets enhanced leading to higher rate of viscosity. The natural polymer present in guar gum allows it to produce highly viscous diffusion however, this happens only when the polymer is added with suitable solvent. 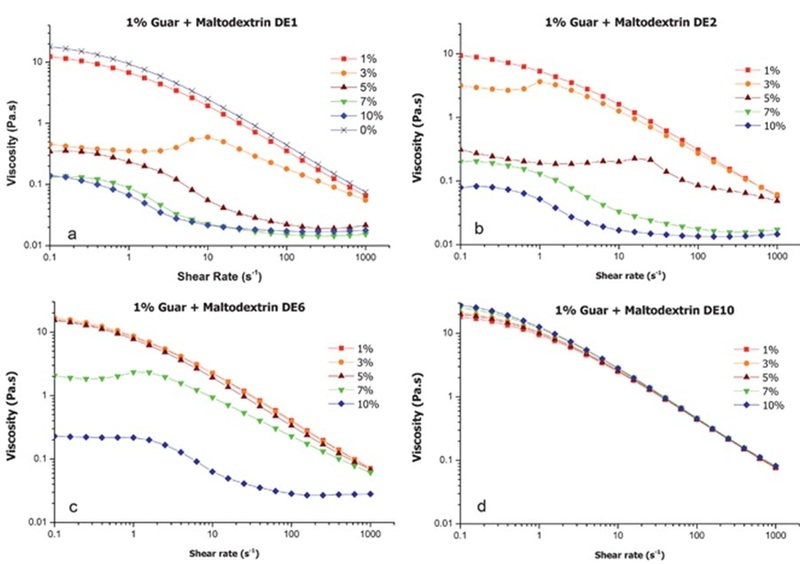 The presence of β(1-4) D-mannose and varying amounts of α(1,6) D-galactose side chains remain the strong feature that shows economic stabilizing and thickening property. 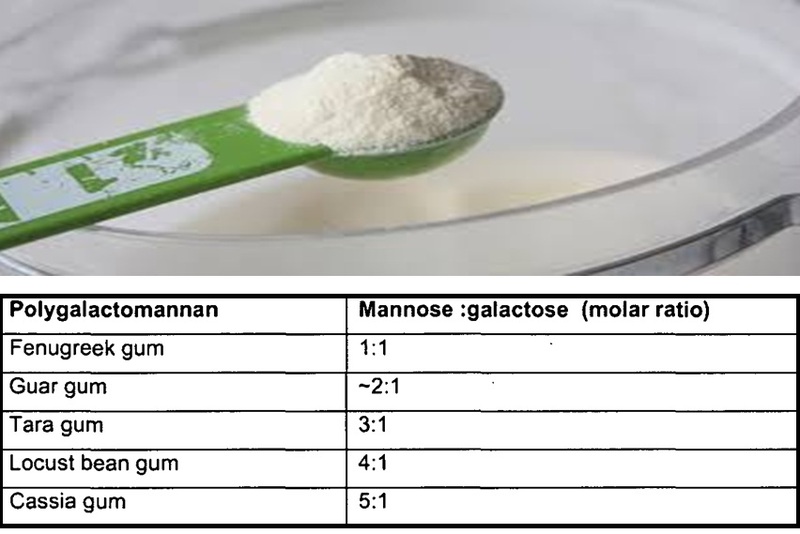 The mannose to galactose ratio in appropriate proportion makes it easily soluble in water and to become a highly viscous product. Several research analyses have also been made to prove the comparatively higher thickening property of this powder with that of other seed gums. Application of high temperature viscosity measurement to obtain thermal degradation of guar seed endosperm powder proved to have shown degradation at high concentration. In addition, the reversible time based thickening also changes in its property. When applied in lowest concentration, the change in reversible time appears to be absent. The heat and flow of this product also appears to degrade in its property when tested for molecular weight and gel permeation. Minimum 2 hours observation is required to see maximum thickness formed of dissolving and there is a strong link between the size of particles present in the powder and the rate of hydration. Guar endosperm with low molecular weight also appears to show increase in polydispersity at heat degrading condition. When combined with cellulosic and hydrated minerals, it exhibits excellent bonding. A proportionate change takes place if the concentration is increased. Solutions prepared by using gum powder at high temperature this endosperm powder reaches excellent rate of bulkiness. However, at the final stage dissolution done with cold water shows stable results than those that is done at high temperature. The desirable temperature to obtain increased thickness rate is from 25-40 degree C.
Guar gum is known for its excellent viscous property. It provides excellent results of thickening when hydrated at cold water. Though hydrated at high temperature also provided fast results, cold water dispersion shows stable results. Plant seeds were paid less attention usually, but, seeds appear to have equal properties which can be applied for different applications. Our ancestors were able to trace the truth that plant seeds give out wonderful results in many processes. Guar plant is one among them, where nuts have been found to bear large significance in several industries. When it comes to medicinal properties, this plant remains a good resource to treat prominent health issues. The endosperm is them soaked in water or sulphuric acid to make it flexible for shedding the seed hull. The soaked nuts are then ground to completely remove the hull and the final product is applied for medicinal applications. In addition, the grinding process stays in accordance with the requirement of particle size. 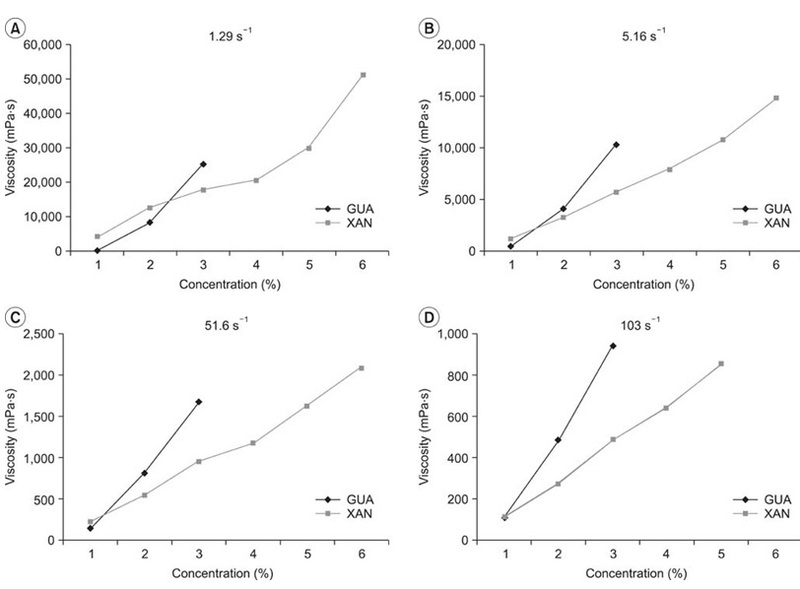 The particle size of endosperm was also applied to study the kinetics of guar gum. The Hydration kinetic study had been one of the primary sources that showed the gel strength of this product even when applied in minimal quantity. Researches and tests performed over hydration methods helped to understand the fact that this seed gum has increased absorption capacity over oil-water as well as air-water interface. 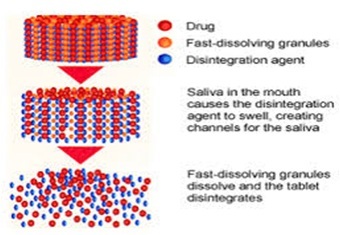 The results helped the drug industries to apply the endosperm to obtain oral controlled drug delivery system. Therein, it was found to show potential hydrophilic carrier properties that further seed gum of guar plant protects drug during transit from mouth to colon. Partially hydrolyzed through enzymatic process in which the chemical structure remains the same but with minimal molecular strength. The product obtained through this manufacturing process is applied for its foam forming, swelling and stabilizing properties. For example, the viscosity of this gum powder obtained through hydration process is about 10mPa in 5% of aqueous solution and it remains stable when applied at minimal pH. It is for this same principle, seed endosperm guar gum powder is highly recommended as a dietary fiber, as a nutritional agent and above all as a integrated food ingredient. 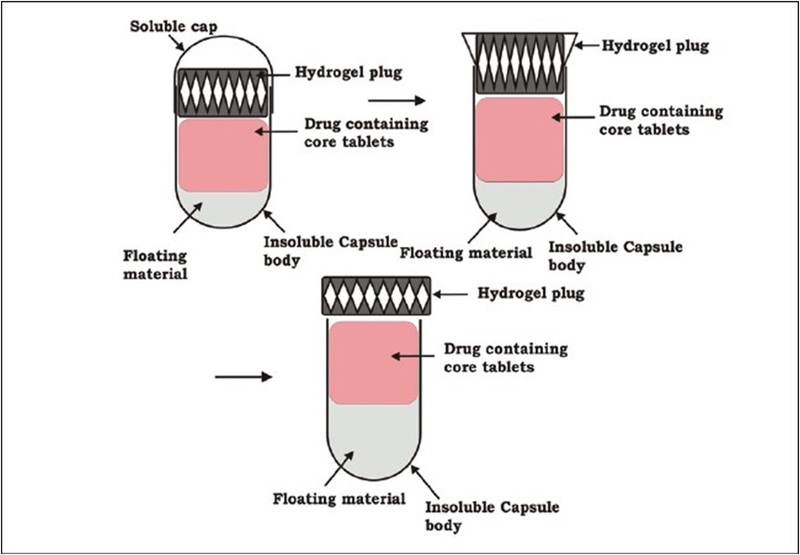 Drugs become difficult to swallow due especially when it is concerned with size and capsule formation with insoluble body. The natural properties inherent in the seeds of guar are the key factor that encouraged several research professionals to work out the same on easy transit of pills from mouth to colon. Apart from textile, food, oil and petrochemical industries, guar gum powder bears significant aspects when the same is processed under different methods. It has inherent medical usage for which pharmaceutical industry finds equal range of usability like that of other industries.